Extension of locomotor that implements move_base's functionality. locomove_base combines the engine that runs locomotor with the state machine that controls move_base. Because they are interoperable, any global planner (be it nav_core or nav_core2) can be used. If move_base used a nav_core planner (which is standard), it will be loaded into locomove_base using the nav_core_adapter::GlobalPlannerAdapter2. If the move_base configuration used a nav_core2 global planner using nav_core_adapter::GlobalPlannerAdapter, locomove_base will just use the nav_core2 global planner without the adapter. Similarly, if the move_base configuration was using a nav_core2 local planner with the nav_core_adapter::LocalPlannerAdapter, locomove_base can use that without the adapter. However, because nav_core local planners are not forward compatibile, arbitrary nav_core local planners cannot be used in locomove_base. However, if the local planner was DWALocalPlanner, locomove_base will just use DWBLocalPlanner since its parameters are backwards compatible. In order to be able to use RecoveryBehaviors, we must be able to get a raw pointer to the Costmap2DROS objects. Thus, the only type of nav_core2::Costmap we allow is nav_core_adapter::CostmapAdapter which will provide the pointer. As in move_base the recovery behaviors are specified here as an ordered list on the parameter server (or uses a default set if no list provided). Each is initialized with the pointers shown above and stored. 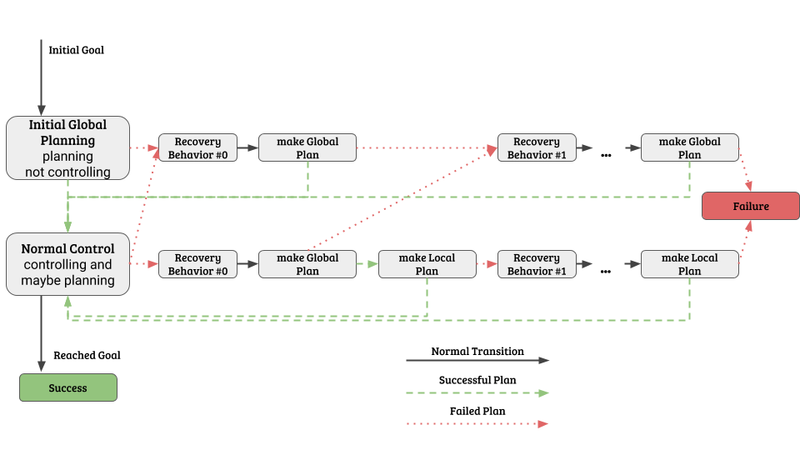 When an error occurs, the recovery behaviors will be run using the runBehavior method in order, with the logic shown below. If all the planning is successful, the state machine will travel along the left side of the diagram, i.e. * When it gets its initial goal, it will perform global planning. * When that succeeds, it will proceed onto local planning (i.e. controlling) and possibly making more global plans. * When it reaches the goal, the navigation was successful. If either global or local planning fails, move_base will begin to execute the recovery behaviors in order. After each recovery behavior, it will attempt planning again. If that planning is also unsuccessful, it will proceed onto the next recovery behavior, and so on until the last recovery behavior leads to failed planning, at which point the navigation will fail. move_base will reset back to standard operation if there is a successful plan made with the planner that originally failed. * If global planning fails, move_base will return to normal operation after a global plan is successfully made. * If local planning fails, move_base will try to make a new global plan after each recovery behavior, and then will only return to normal operation after local planning also succeeds.